Hard and fast sticky chinese rubber. 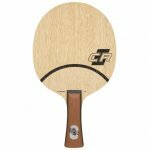 YinHe/Galaxy J-1 single-ply 10mm Ayous blade! JOOLA Toni Hold White Spot = famous defensive blade!